This week we would like to suggest a different dish. A stuffed pasta salad, with mussels and white tuna A luxury to brighten up the days of summer even more, or any day of the year, sent to us from Margarita’s kitchen (Acibechería). Check out the recipe and prepare to enjoy! Finely chop the shallots and the red pepper. Gently fry the shallots and red pepper. Blend the cheese, the mayonnaise, the white tuna, 4 mussels, the spices and the fried shallots (just enough for everything to be well mixed). Put the mixture in a pastry bag. Put aside. Cook the rigatoni as indicated by the manufacturer. Cool in cold water to stop them from cooking further and drain well on a clean cloth. Prepare the vinaigrette by chopping some piparra peppers, gherkins, olives and capers, before adding the pickled sauce from the mussels can. Put aside. Make a small cut in the pastry bag and fill the rigatoni. 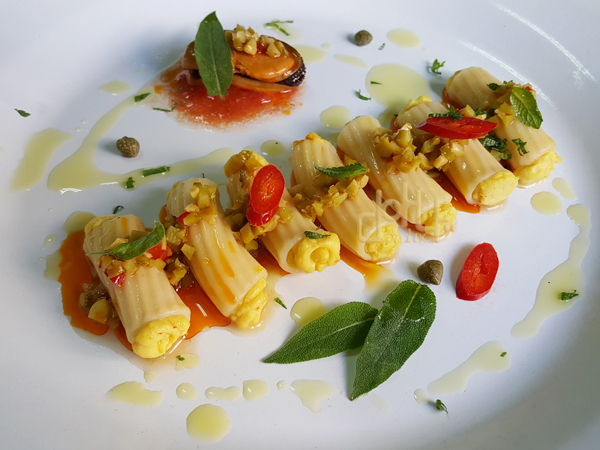 When serving, add the vinaigrette over the rigatoni, and accompany each dish with a generous mussel. A real luxury of a salad. Thanks, Margarita!